Rowdy Muir in his office near Flaming Gorge at the Ashley National Forest. Right now, fire leaders who are qualified to be area commanders must wait to find out whether they'll be pressed into action. "I came up the hard way," said Muir, the son of a forester. "I learned how to swing a Pulaski. I ran a chainsaw in '88 [at the Yellowstone fires] for 30-some days. It helps you remember what it's like to be on the ground." Thirty-two years later, he's a wildfire commander. And he said that experience on the ground makes him a better leader of wildland firefighters, most recently as an area commander. There are just three Area Command teams in the nation, and Muir led one of them last season. Area commanders are like generals. They work from afar to prioritize human and material resources. They shift resources to where they are needed among several fires under their command. "It's anywhere from wildlands suppression crews, engines, dozers," he said. "Logistically, caterers. Aviation is the big one. It's the incident management teams. We actually have to look at the complexity of the fires." On Black Saturday during the 1988 Yellowstone National Park fires, daytime turned into night because of the thick smoke. It was one of Rowdy Muir's first years fighting wildfire. Here, an unidentified firefighter works against the flames. Muir's been on some of the worst fires in the Mountain West: The Yellowstone fires in 1988, the 2006 Rattlesnake Fire in Idaho and the biggest fires in Utah's modern history, Milford Flat, and Colorado's, the Hayman Fire. Muir is a district ranger at Flaming Gorge on the Ashley National Forest in eastern Utah and Wyoming. In a tour of his office, he talked about a few shadow boxes that contain small tokens of the strong relationships he's made during those disasters. One's from a U.S. Interior Secretary. But many others come from the small communities where his teams have battled flames. "People want to pay tribute to you," he said, "or thank you for the things you do, so you end up with a pin or a coin or a belt buckle." This year's fire season is just beginning, so his days are filled with a lot of hurry-up-and-wait. Area commanders like Muir only get called into action when a disaster gets big and complicated, like Montana's fires last summer. 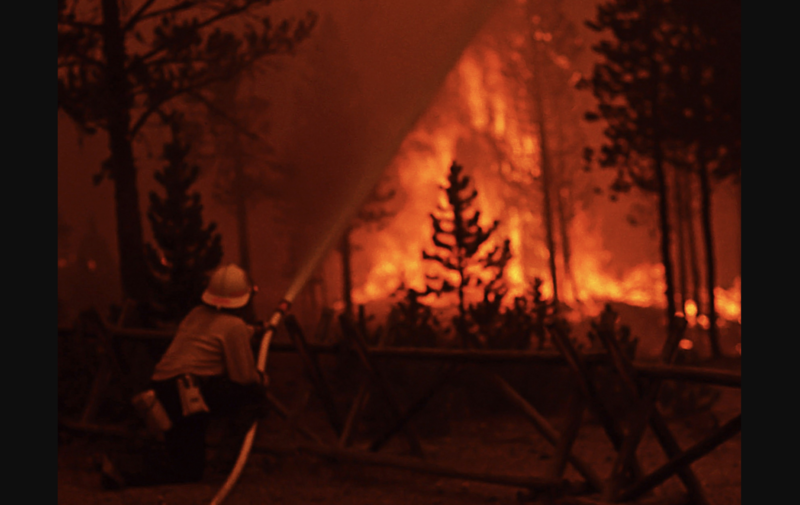 The role sometimes requires coordinating the efforts of tens of thousands of people, and Muir's learned that it's not just about putting out fires. 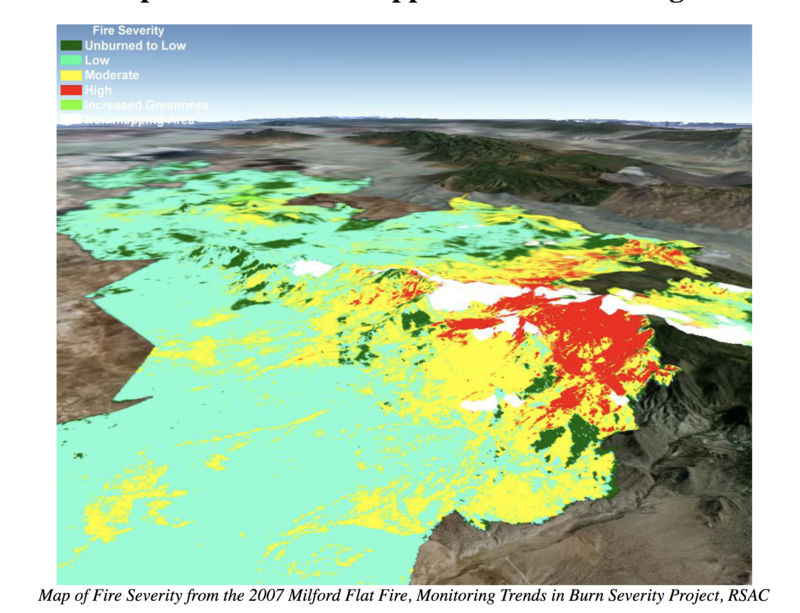 From the Monitoring Trends in Burn Severity Project, the Forest Service Geospatial Technology and Applications Center developed this heat-severity map of the 2007 Milford Flat fire. The biggest in Utah history, Rowdy Muir led the fight as incident commander. "When I was young and energetic, I'd have jumped off a cliff to cut down a tree that was on fire — that's just the way it was," he said. "But I think as you come up through the system and you know you learn lessons and you see things, then your whole mindset changes." This became personal for him when his own daughter trained as a firefighter. "From then on, I think fire became more about the people than about the task," he said. "You know I have to thank her for changing my thought process." Muir's seen wildland firefighting change in his time. Powerful new communication and mapping tools help save lives and property. But one thing hasn't changed: Muir's love for what he does. "It's no different than a first-year firefighter going on the first fire," said Muir. "It's the same thing. You are excited and you want to get there and you want to do good. And after a few days it really wears on you. Fire's an exciting, exciting job." And Muir said he's sure to keep sight of one thing: "I've always told everybody I've ever worked with, ‘Is this the mountain you want to die on?' And I think people look at that and say, 'No, it's not.' I don't think any mountain's worth it." Forecasters predict a severe fire season ahead. So, for now, Muir's just looking on — but if those predictions pan out, he'll be at the helm again this summer. Wildfire season is coming up. And new restrictions on fireworks might help reduce the ones’ that are man-made. 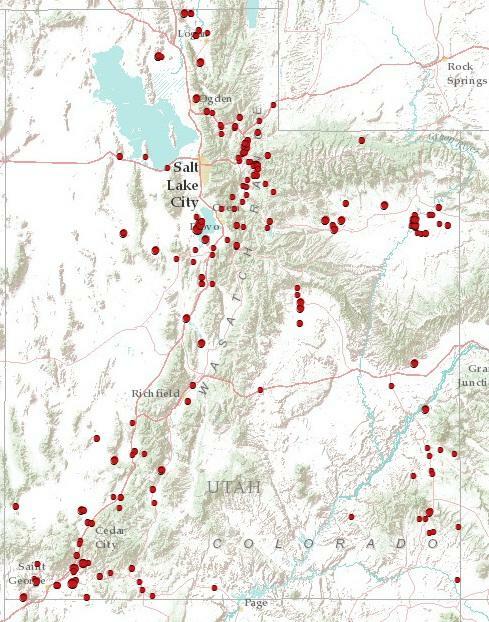 High temperatures and dry conditions have thrust Utah into what could be a difficult fire season. 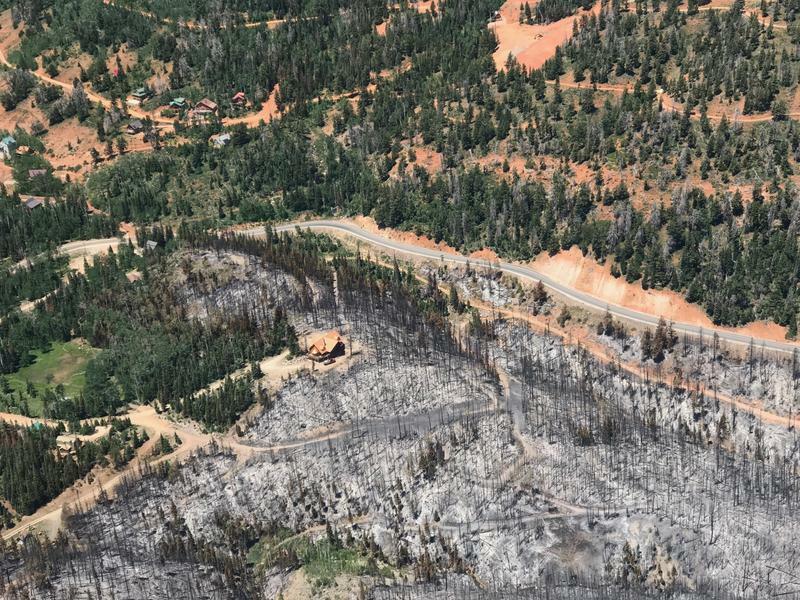 Crews contained the Flood Canyon Fire in Tooele County on Monday and the National Weather Service issued a “Red Flag Warning” for the St. George area over the weekend. Jason Curry is a Utah State Fire Information Officer. 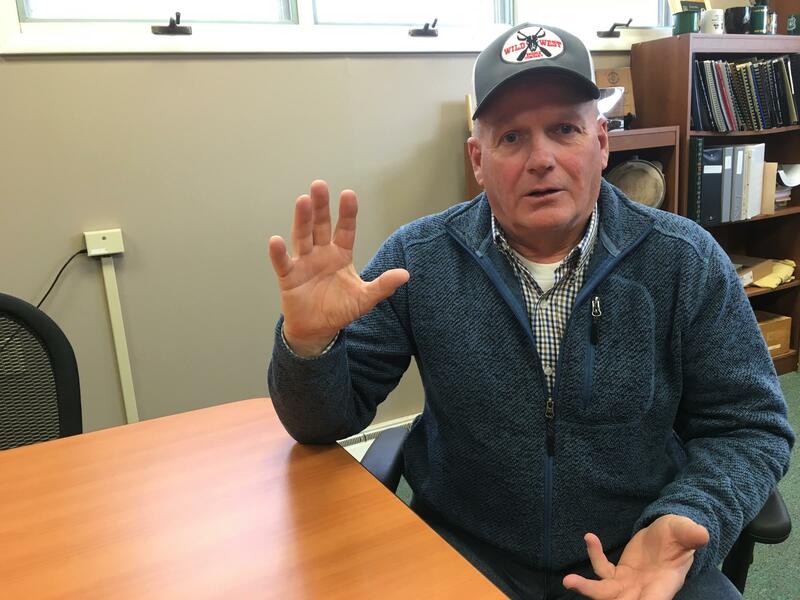 He says because of late rains and higher snow-pack, this summer probably won’t have as many wildfires as last year, but the risk is still above average.